If you love mountains Kitzbühel in Tyrol is one of the most awesome places you can be in Austria. In summer you have the green mountains surrounding you, blue skies and small lakes and rivers that scatter around the Kitzbühel area. And in winter Kitzbühel is the place to be - it became famous for the Hahnenkamm skirace at the Streif. If you are brave you can try that track on your own but make sure you have prepared your skis and sharpened the edges - this is nothing for beginners. Besides the ski-events Kitzbühel has a lot to offer. The gorgeous oldtown is ideal for a shopping trip or a coffee (or Glühwein) at the terrace covered by warming furs. This would also be a nice place to take pictures as well. The Kitzbühel area has a lot of first class venues and hotels to offer. We were honored to document a wedding at the Grand Spa Resort A-Rosa ***** in 2012. If you like a luxurious environment with alpine style this would be a great place for you. Another tip would be Rosis Sonnbergstuben which is a famous location even for international celebrities. Located in the middle of the mountains you will get an increcible view over the mountains of Kitzbühel. Take a look at these images to get a better impression of what we are talking about: Grand Spa Resort A-Rosa, Rosis Sonnbergstubn. If you like Castles this would be a nice idea for you: Schloss Münichau, built in 1469. Back to the future, to a place where history lives on through original features. That is the motto of Schloss Münichau. The historic hotel with its authentic architecture and interiors also houses a gourmet restaurant. You can even have your wedding at the romantic castle chapel. So there are plenty of places to have your wedding in Kitzbühel, all within a couple of minutes driving distance. Due to that Kitzbühel is a great place for winter or alpine and summer weddings! By the way Ninas mother is from Kitzbühel so she knows the place quite well. If you need any further help, just let us know! 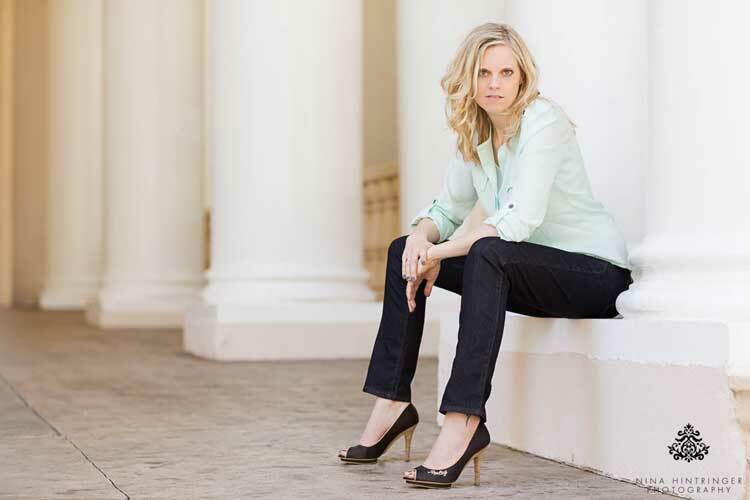 Last summer we were celebrating our 10th business anniversary and we gave away a free shoot. Nicole and Michael were the lucky winners, a lovely couple from Upper Austria. They are moving to Singapore for four years in a few months and they wanted to take some wonderful Austrian memories to their new home. 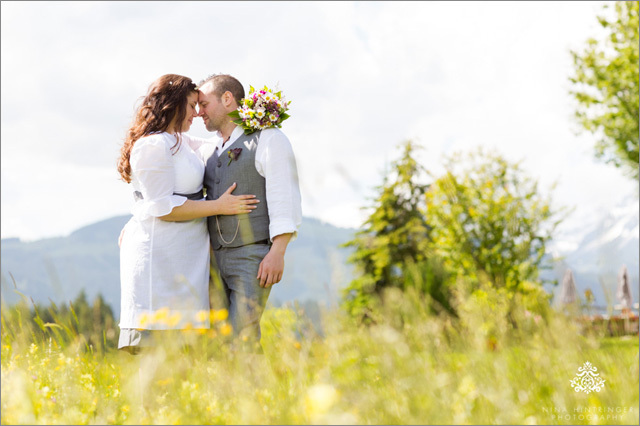 Now it was time for this special couple shoot and we met in Kitzbühel at the Schwarzsee. I'm absolutely in love with this lake as I spent all my summer holidays there when I was a child. When I think back there are lots of beautiful memories in my mind, e.g. there I learned to waterski. We had a great time and a lot of fun with Nicole and Michael. Time flew by and we were lucky that it did not rain too much for the main part of the shoot. We would like to thank Der Visagist Michel Schiwon for taking care of Nicole's make-up, so she could relax and enjoy right from the beginning. Always a great idea to book a make-up artist for your shoot, so you don't have to worry about your styling and the enjoyment starts even earlier. Dear Nicole and Michael, thanks a lot for coming to Tyrol. It was a pleasure to work with you and we hope we could create everlasting memories! We wish you all the best for your stay in Singapore and if we should travel into your direction within the next years, be prepared for a call - we would love to meet you again! but at the end it's always worth the effort. LESS is MORE and so it's possible to show as many photos as big as possible. When you look at an album with hundreds of photos you are overwhelmed and each image cannot really breath on a spread. So it's not really fun to browse through the book as there is so much going on on each spread. If you don't know where to start when it comes to your image selection for your wedding album you can always start with your photographer's blog post. Usually there are some great emotions, details and also the highlights of your ceremony and party presented. You can go from there and add photos with a special meaning. 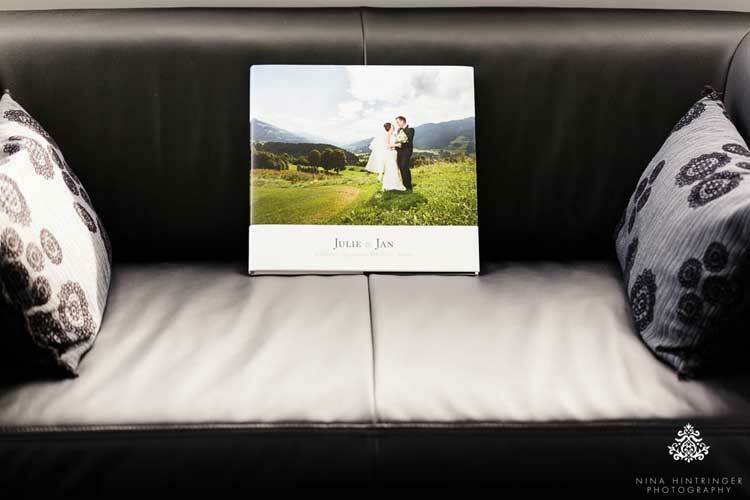 Here you can see the final result of Julie & Jan's coffee-table book. They did a great job with regard to their image selection. They started with some photos of their preparations, followed by detail shots of rings and flowers, their first look with beautiful emotions, their couple shoot photos, lots of ceremony moments and emotions, some ballroom decoration, all the great moments and laughter during their speeches, their first dance, fireworks, cake cutting, rocking the dancefloor and ending with an impressive sparkler shot. It's fun to flip through their album and it never gets boring. Not too much or little of one part of their wedding day. Enjoy this beautiful wedding day again and if you would like to see and read the whole story check out Julie & Jan's wedding blog post. The love story of these two sweethearts is just amazing! You may have already seen the engagement session we did with them a few month ago in Innsbruck and in this blog post we explained how they met. Both working at Google - Julie in New York City and Jan in Germany - they first met during a business meeting. Their first five dates were taking place in five different countries all over the world: Portugal, Iceland, Germany,... just to name a few and one year later Jan move to New York. 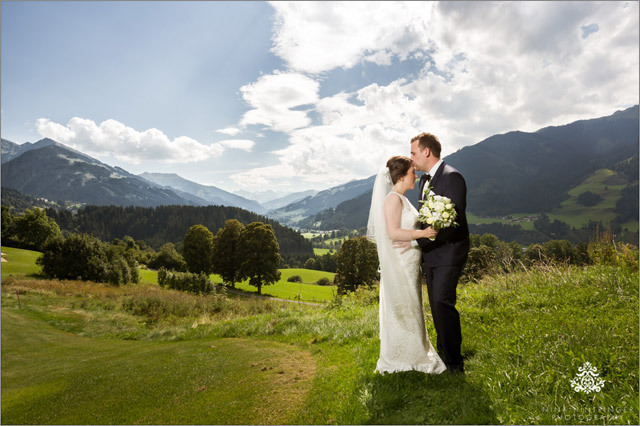 For their destination wedding they chose the wonderful Grand Tirolia in Kitzbühel, Austria's Best Golf Hotel 2015. 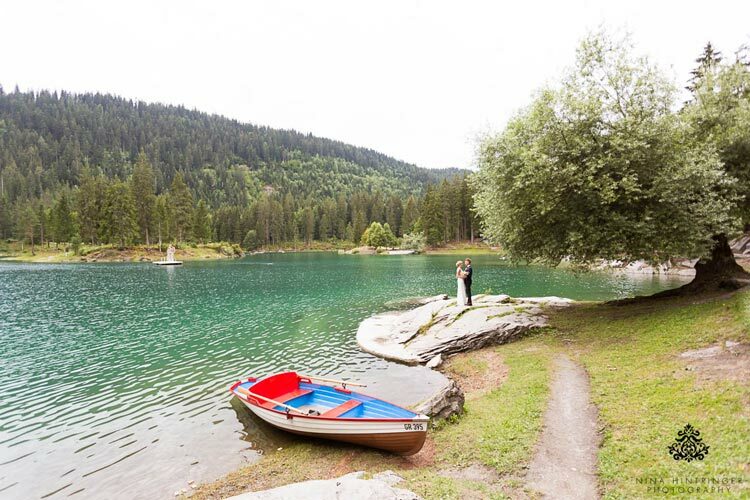 All wedding guests travelled to this wonderful location in Tyrol, Austria and the bridal couple was really surprised but more than happy that ALL invited guests followed up on the invitation and travelled to Austria to share their special day. Even with thousends of kilometers to travel from the United States, Germany, Switzerland and the rest of the world their wedding guests did not spare any efforts! Bride and groom both have multicultural backgrounds: Swiss and German roots on the groom's side as well as Chinese and American/Jewish roots on the bride's side. All those things were part of the beautiful outdoor ceremony held by Henrik Eder - Der Hochzeitsredner at the terrace at The Grand Tirolia. They also incorpoarted some Jewish traditions like braiking a glass to symbolize the fragile nature of life as well as the uniqueness of the moment that arises and passes away, a letting go of the past and looking toward the future. Dear Julie and Jan, we wish you all the best for your future as a new family and to say it with your groomsmen's words: Every minute, every hour, every week and every year - we will toast you and we start right here! - Cheers and enjoy your honeymoon to the full! Special thanks to my loving parents for taking care of our little daughter, even on my mom's own birthday. We are really thankful to have such a caring and supporting family - without you it would not be possible to do our job as wedding photographer besides having our own little family. Thank you from the bottom of our hearts! Do you remember Katrin & Manuel?! We were honored to document their civil wedding a view weeks ago in Switzerland, you should not miss this colorful wedding: Follow your Heart | Katrin & Manuel | Zollikon, Switzerland! Katrin and Manuel are such a great couple and we were really sad that we were already booked for the date of their church wedding in Kitzbühel. Katrin called us at the beginning of this year and we got along very well right from the beginning. 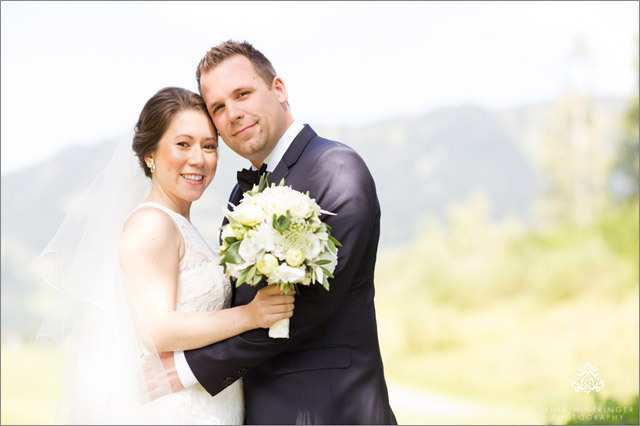 As we met in person we all knew it will be a perfect fit ;) And so we had the pleasure to photograph their Get-Together on Friday at the incredible Grand Spa Resort A-ROSA in Kitzbühel as well as their Brunch at Rosi´s Sonnbergstuben on Sunday! We also planned an outdoor couple shoot on Friday but the weather was really bad, it rained cats and dogs and it was freezing cold. So we changed our plans and did a short couple shoot with the two after their brunch on Sunday.